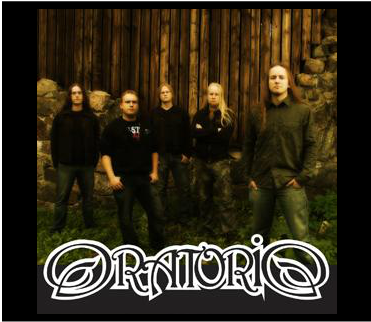 Oratorio hails from Finland and has produced some quality Power Metal/Metal offerings. The band originated in 1998 and the meaning behind the name Oratorio, is "A Religious Music Piece." The name was picked randomly as they scrolled through an Encyclopedia. Their first release was a demo called "Vahan" and was mostly sung in the Finnish language by Joel Hekkala. The vocals on the demo, were not up to standard so Joel began working hard to improve his vocal delivery. As time moved on, the band began writing their lyrics mainly in English. In 2000 the band was part of a Finnish christian Metal compilation called "The Rose Metal Collection" Featuring the band's song "Shines the Light." In November of 2003, Oratorio released their first full length album, "The Reality of Existence," with the help of Christian Rivel of Rivel Records. Smok'n Power Metal with a duo guitar approach is what we find on this debut album. The production is really good for a first full length album and rocks hard. "The Reality of Existence" was received well by the media and audience so 2004 meant lots of gigs for the band in Sweden, Norway, and Germany. In 2006, Oratorio was ready to work on a new album and decided on a different record company called Mata Records which is their guitarist, Thomas Mata's brother's, own Record Label. The band wanted to make huge improvements on their sound so they decided to take more time on the recordings. The band did a release-gig for their new album "Redemption," in Turku on the 18th of November 2006 at the Matta Nakyvissa Festarit, the biggest christian youth festival in the Nordic countries. The release gig was successful because the following week the album took 36th place on the Finnish charts! Oratorio leaned away from the Power Metal genre and moved more towards the Heavy Metal genre while producing " Redemption." The Production, on this gem, is excellent being very full and clear sounding making it easy to hear what instruments the musicians are playing. The extra time spent in the recording studio really paid off. I must say that "Redemption" sounds much Heavier than "The Reality of Existence" and is guaranteed to peel paint off walls. Guitar work is still done from a duo guitar approach which never is a bad thing in my opinion. This approach helps to give the music a fuller sound and gives the audience more variety to listen to, making the album more interesting. so do think that I will obey You! Won't ever take His love away from me! Vocalist Joel Hekkala has a unique voice that works well with the Power Metal/Metal Genres. His unique voice helps to distinguish Oratorio from other bands in the same realm of music. If you don't like very lengthy songs then you will appreciate Oratorio cause they like to keep their songs in the normal range with most songs clocking in at the 4 to 5 minute range. Drummer Veikko Kurki does a great job on drums for Oratorio I really like his style as he bangs out the Truth. If you like your Metal Fast and Heavy then I can see you liking what Oratorio has to offer so pick up a copy of their releases and Rock On!